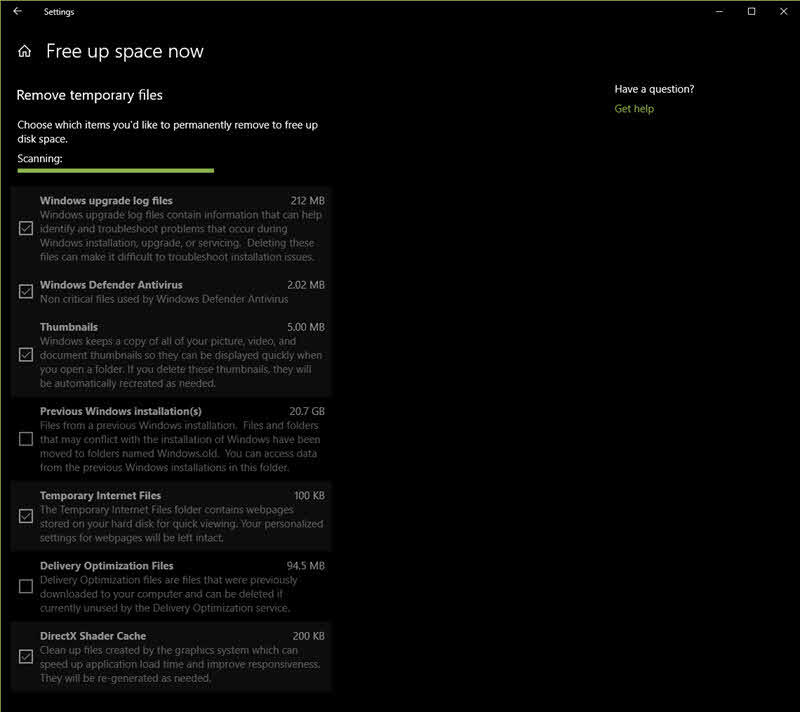 Microsoft is trying to improve the Windows 10 Storage Settings app to provide you an easier option to free up the storage space, by getting rid of the temporary files and contents that you don't need. Along with Windows 10 Insiders Preview Build 17074, they have previewed the upcoming changes of next major build of Windows 10. When the Storage Sesnse is turned on, it will free up the space when your PC is low on space. In next major version of Windows 10 (Redstone 4 build), Microsoft is improving the Storage Settings page with the option to launch the Disk Cleanup functionality. 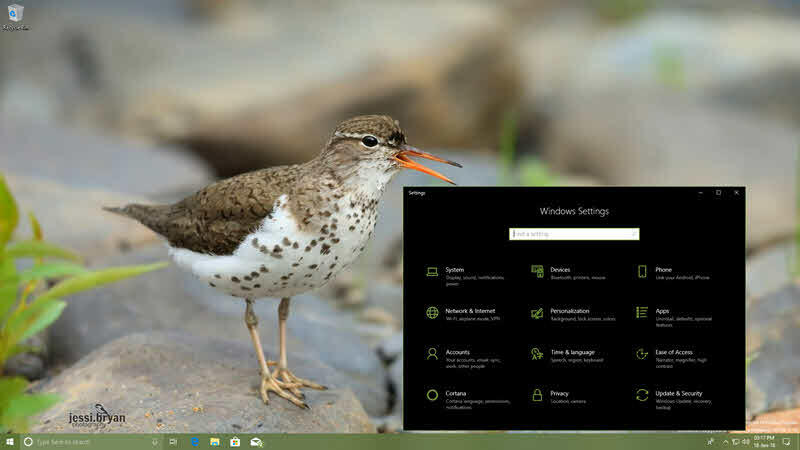 To launch this, open the Windows 10 Settings application and navigate to System tab. Click on the Storage tab from the left navigation pane. 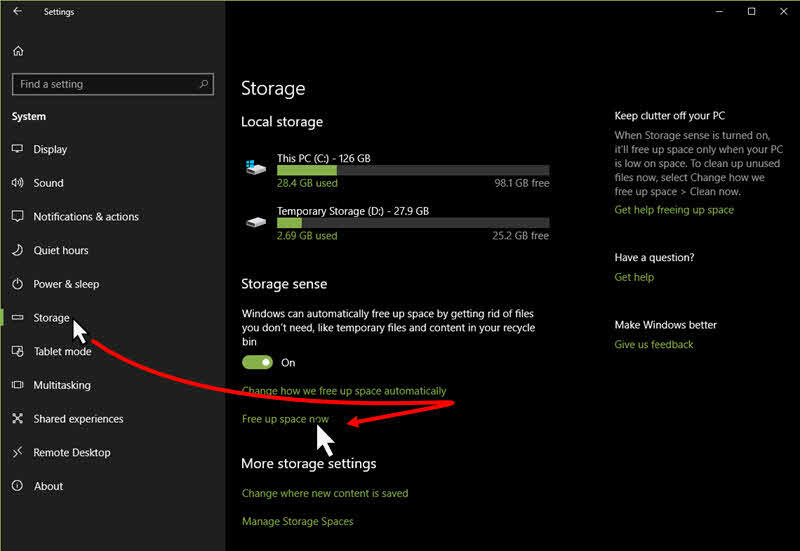 At the right pane, you will now see an option labeled Free up space now, under the Storage sense section. Click on it to launch the disk cleanup page. When launched, this will scan the system to find out the temporary files that you don't need. This includes: Windows upgrade log files, Thumbnails, Antivirus logs, Previous windows installation (backup) files, Temporary internet files, Files in recycle bin and more. Select the files/content that you want to remove, and click on the Remove files button to begin the clean-up process. Once completes, you will gain that free space again to use. Was the post informative? Do let us know, how much you liked this new feature enhancement in Windows 10 to clean-up the unused/temporary files from your system. Don't forget to read the other posts on Windows 10 forthcoming changes in Redstone 4 build. If you have come this far, it means that you liked what you are reading (Windows 10 disk cleanup functionality will be available in storage settings ).